As a fan of the X-Men films, but not a reader of the comic books, I don't have much to say in comparing how faithful it was to the comics, or which character was or wasn't included that should have been, but I do know that X-Men: First Class fit right in with the other previously released films in the series. This prequel looks at the X-Men before they were rivals -- when they are just finding out there are others in the world like them. 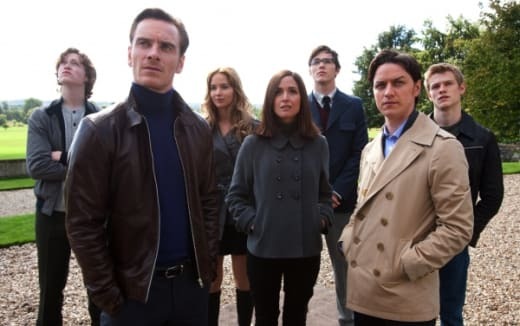 Set in the Kennedy era 1960's at the height of the Cuban missile crisis, the film centers on two very powerful mutants - Charles Xavier (James McAvoy), a smart telepath who just earned his PhD and Erik Lehnsherr (Michael Fassbender), a holocaust victim who can move metal with his mind. The two meets while trying to stop Shaw (Kevin Bacon) from plotting a nuclear war with Russia. They are friends in this prequel, which is a strange turn of events considering movie fans only know them as enemies. This obviously wasn't always the case as they work together to try and stop Shaw and his mutant followers, including the stunning January Jones as Emma Frost. Things start to change when Charles and Erik begin to feel very differently about how mutants should relate to humans. There is a line in the film that sums up their opposing beliefs perfectly. Charles accuses Erik of believing all humans are like Shaw (even though Shaw isn't human) and Erik accuses Charles of thinking all humans are like CIA agent MacTaggert (Rose Byrne). These two opposing views are the basis for the neverending rivalry between the former friends and the film illustrates the opposing viewpoints splendidly. 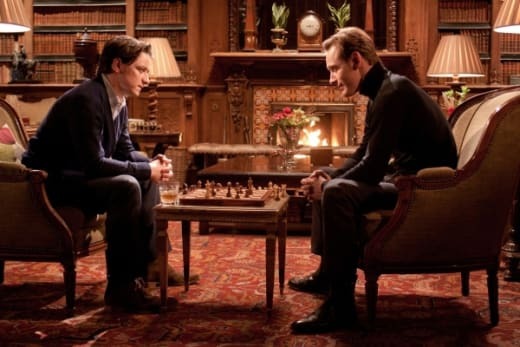 The chemistry between McAvoy and Fassbender is evident from the start and they are an amazingly equal match for each other, both in looks and power. It is awesome to see these two handsome young men getting along on screen, while knowing they are going to become Professor X (Patrick Stewart) and Magneto (Ian McKellan). First Class fills in many of the missing pieces from the other flms in the series. We really have no idea how Professor X and Magneto become enemies. There are many comment in the first X-Men that give us some indication the two of them were allies and friends at some point, but now we know the real story behind the tumultuous relationship. We also find out why Professor X is in a wheelchair, how Magneto got that silly looking helmet, and why Mystique (one of Charles' best friends) becomes a Magneto ally. The entire film has a fresh feel with the young mutants finding their footing in the real world. The young cast provides a great energy that wasn't there in the other films. They are eager to learn, but still youthful at the same time. There is a great scene when they are all having fun showing off their powers and it goes a little too far -- they end up destroying the CIA grounds, much to the chagrin of Erik and Charles. Director Matthew Vaughn integrates real-life historical events into the film. We learn that mutants were involved in the Cuban missile crisis and it was really a government cover-up that lead to what we believe today. It all makes perfect sense now! The film is also full of little tidbits and comments alluding to what is to come -- at one point Charles makes a comment about losing all his hair! Those moments in the film keep it going and provide lasting energy from start to finish.